Ted opened the meeting on the grounds of the Scout Brigade of Fort George after watching the Scout Brigade parade. David Randle arrived in his uniform as Major General of the Scout Brigade of Fort George. The committee discussed with David Randle and Ron Nicholson of the Scout Brigade of Fort George how the commemoration event could fit in with the Scout Brigade. The Brigade program is as follows: On Saturday morning, the Scouts are in the fort for opening and activities. They have lunch at their site, parade into the town, then have an afternoon battle. On Sunday morning, they are back by the fort for the final battle, Scouts' Own, and closing. The Sunday battle involves less moving and is thus easier to watch. In 2004, there are 610 American and 760 Canadian participants in the Scout Brigade. The committee sketched the following plan with the concurrence of the Scout Brigade: At 11:00 on Saturday morning, the plaque will be unveiled in Fort George using Ron Dale's mobile plaque stand with curtains. This will be a brief ceremony as the Scouts will be present. Extended speeches will wait until the banquet that evening. On Sunday, WJ'55 participants will be invited to view the final battle between 09:30 and 10:30. Parking and Fort entrance arrangements will have to be made with Ron Dale. 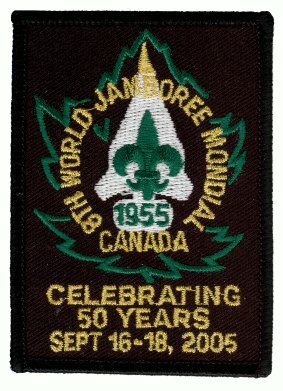 The committee discussed including promotional information about the WJ'55 anniversary crest in the Scout Bridge registration package. The registration package goes out at the end of February. The committee will have to have materials ready by that time. The committee will also make WJ'55 participants aware of the opportunity to order Scout Brigade crests. The Niagara Wine Festival will be on during the event. Post signs marking the location of various parts of the original WJ'55 campsite. Bury a time capsule. These can be easily made by solvent welding ends on a large diameter plastic water pipe. Liam announced that the web site at wj55.org is operational. It provides some basic information and access to the WJ'55 Committee minutes.